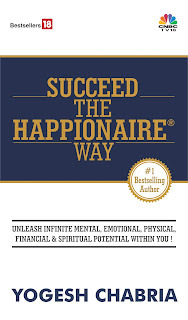 Yogesh Chabria - The Happionaire ​Blog - Best Motivational Speakers In India - Inspiration, Success: Control Your Greed! Lately I have been getting several e-mails from fellow Happionaires thanking me about introducing them to professional trader - Aniket Waghmare. The returns have been over 100% just in a matter of days, making a high of over 150% in 5 days. This is a positional call option which Aniket feels has a lot of potential. I’m glad that so many Happionaires are benefiting from the knowledge being shared and creating wealth. I know that such returns are welcome in the present market environment. Let me correct myself- such returns are always welcome. However what made me write this post is something what a fellow Happionaire wrote to me. This person after having made 100% so soon, told me how he planned to invest his entire capital into Options trading based on the advice he was getting from Aniket. He was telling me how he was feeling bad he hadn’t invested more money in the beginning itself. For somebody just starting out with options, a return of 100% might seem a lot and would surely lead to greed. Why invest for the long term, where you get 100% only in two to three years, when here you can get it only in one or two days? Before you answer that question, just remember that if things don’t go in the same direction of your call, your entire capital too can be wiped out in one or two days. Of course, we all hope that nothing like that happens and professional traders all have a very strong network which helps them find out which way short term capital is flowing. I have also noticed that when markets are extremely volatile, the returns from trading tend to be extremely high for the people playing the game from the inside. And at the same time I have also seen the losses from trading being extremely high for people playing the game from the outside. Does that mean you simply ignore it? I feel it is best to take a more balanced view. As suggested earlier, the best way to play Options is to put in around 10%-15% of your capital, depending on how much you are comfortable with and make it grow. You can pull out your profits and use it to invest for the long term. The more you know, the more you benefit and that is why I loved learning new things and meeting new people. Lately I have been interacting with a few HNI investors who invest in art and I’ve been trying to understand more about the world of art. It is great fun learning new things and interacting with people who are on the inside of the game. Just one thing – even if you know people on the inside make sure you keep your greed under control because nobody is perfect. Read what others had to say about Bollywood, Builders and Options and feel free to share your ideas too! Thanks for this simple but honest warning. There are very few people who warn others specially when the returns are so good. Most others would simply boast about such spectacular returns. I plan to start a Hedge Fund soon and I would love to have your views too. Will be sending you an e-mail. Please do take time and look at it. Excellent work and this is one of the best places to be if you are an investor in the Indian markets. Oh also Girish- interesting to see people from the Hedge fund circuit here. You coming out with Global Macro? I never knew there was so much potential in options. A fellow Happionaire was telling me how the call today is up more than 200%. It is almost unbeliveable for me to see such high returns. All those trading in options (or futures) should be careful and not get carried away by windfall gains. Nobody in derivative segment wins everytime. So never put all your money in options. Trade with caution as it is very tempting to increase your exposure after making some initial profit. Thanks Yogesh and also Shirish for the simple warning to not get carried away. It is very easy to put more money or also think- I wish I had put more I could have made so much more. I'm glad you are warning people Yogesh. Because as you rightly said that the returns can all go in a signle moment because of greed. We should benefit from things and not have too much fear too. Some people have so much fear that they are never able to benefit from oprunitties. A balance of fear and greed shouldd be there. Also besiedes that there is one more use of options and that is to Hedge risks. If investors understand options they can in fact increase their own safety and security and use options not just to trade but minimize risks. A balanced use of Options can be healthy. However I find futures very risky- almost like suicide. Best of luck with your fund Girish. Sure will try to take time out and reply. The e-mails seem to be pouring in much faster than I can handle replying to them all. Rajesh- please also remember that the risks are much higher. Shirish, you are absolutely right in pointing out to the risks and it nice to know that fellow Happionaires are so balanced. Thanks Gaurav. It is best to be balanced always.